Blue jays aren’t uncommon in southern Wisconsin, but I hardly ever see them. I’m not sure if that’s because they don’t like my part of the city, or they flit about so fast in the treetops that it’s difficult to spot them. Well, I spotted one today outside the kitchen window as it flew up from the ground to the trunk of the tree closest to my house. Naturally, I went to grab my camera. 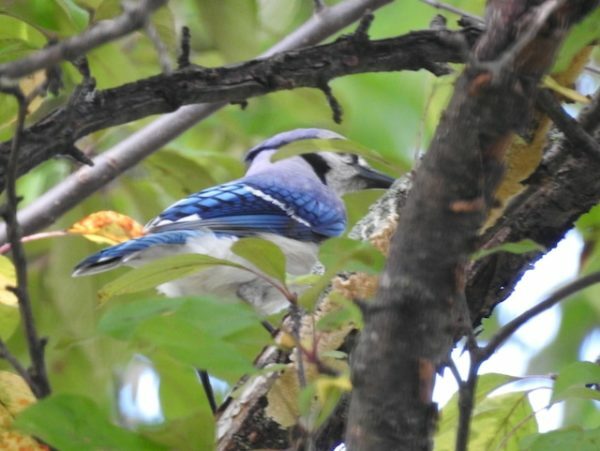 I quickly learned that it is not easy to take a photo of a blue jay. This one rarely stayed in one spot longer than two seconds. By the time I’d focused my camera, it had moved on. The photo above is one of only a few where I managed to get both its body and face in one shot. I’m not sure what it was in such a hurry to get. Blue jays are omnivorous, eating mostly fruits, nuts, and seeds, but a quarter of their diet is made up of insects and other small critters. So maybe it was chasing caterpillars. 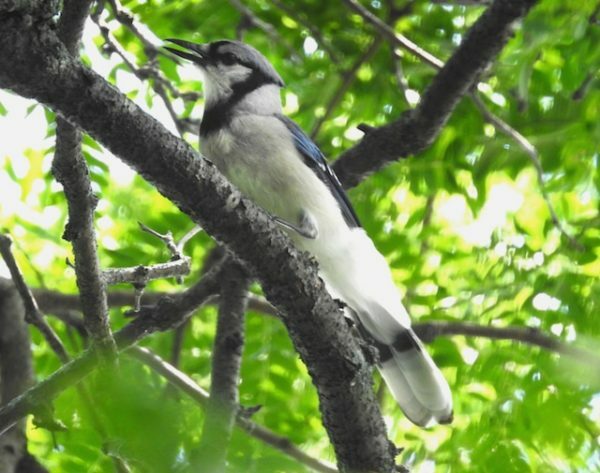 You can read more about blue jays and listen to their calls and clicks on the Audubon Field Guide website. You can browse all my posts about birds here.